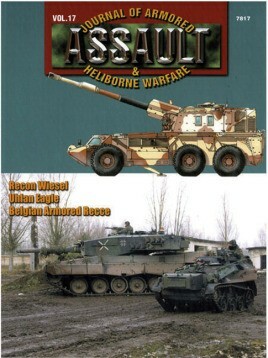 1) Offspring of the Weasel Family - The New Aufklarungsfahrzeug Wiesel I Germany's Airborne Reconnaissance Company 310 was activated in 2000, and it was equipped with a unique vehicle for its task of battlefield reconnaissance. It is a special recce variant of the Wiesel I, with raised roof and modified interior. Unfortunately, due to sales rights restrictions, we cannot offer 7817 Assault: Journal Of Armored & Heliborne Warfare Vol. 17 for sale in your country. Germany's Airborne Reconnaissance Company 310 was activated in 2000, and it was equipped with a unique vehicle for its task of battlefield reconnaissance. It is a special recce variant of the Wiesel I, with raised roof and modified interior. This article examines the new vehicle, of which only sixteen have been manufactured, as it was put through its paces. The article gives a full technical description, as well as explaining how the vehicle will be deployed and its development history. Photos give full interior and exterior views. "Uhlan Eagle 2005" was a large exercise conducted at Poland's Drawsko Pomorski Training Area. It involved some 4,500 British troops and 956 vehicles, plus a small contingent of Danish troops. The size of the exercise offered the author plenty of opportunities to photograph a wide variety of vehicles in action. There are trucks (e.g. the Tank Bridge Transporter, Land Rover, Oshkosh Close Support Tanker) and a whole range of tracked vehicles (e.g. Spartan, Stormer, Warrior, Challenger 2, Chieftain AVRE) and much more. This article is a magnificent look at a British battle group in action. This article traces the development of Belgian armored reconnaissance units from their origins through to more recent years, and provides a potpourri of photos of a whole range of vehicles on many different exercises. This survey shows recce units on field exercises, including such equipment as Bombardiers, Scimitars, Samaritans, Spartan, and Unimogs. The text is informative and familiarizes the reader with relevant details on this interesting topic, especially as Belgian recce units prepare to field new vehicles like the Pandur and Dingo 2.